What is the anatomy of a green capital? Cities with their polluting cars, litter dropping humans, and resource draining habitats are good for our environment. Confining people to densely populated areas allows more space for wildlife and natural environment to grow in the spaces outside of the city, free(er) from the trample of humanity. 80% of the UK’s population now lives in urban areas but as Marcas Grant, chair for the evening at the Arnolfini, points out cities have built high risk factors into the lifestyle choices they present. As the city that has won European Green Capital 2015, Bristol has brought together a room of people concerned with turning the environment that killed more people with its air pollution than it did with its car collisions into a sustainable thriving city. Next up; Bristol’s nose, Alex Minshall (Bristol City Council) on air quality. He believes the way forward is reducing the amount of vehicles we rely on and moving onto electric power. Bevis Watts (Avon Wildlife Trust) becomes the lungs, talking about the abundant ecosystems in our city. In Bristol we have 19 of the 24 habitat types that exist in the UK, something we need to do our best to preserve through partnerships in schools and communities. He also touched on the importance of nature for our mental health and the benefits of spending time outside of our concrete worlds. For the stomach, Simon Roberts (Centre for Sustainable Energy) grumbles about Bristol’s sustainable energy production. He takes a look at the installation of smart meters and how if we’re careful, we can take a grassroots approach in controlling our energy use and understanding more about our energy providers. The guts of Bristol, where our waste is dealt with, is Robert Asquith (New Earth Solutions.) He gives us a snippet of what we can expect from Bristol’s waste and recycling, a subject close to our hearts here at Down and Out, and the findings are very exciting! Robert informed the audience that they are doing their best to develop a complete closed-loop recycling system, where all of the waste is recycled and reused and nothing is wasted in landfill or incinerated. Their vision is to have a 95% diversion of waste from landfill and for all 95% of this to be used as fuel here in Bristol (at the moment only half of our waste goes on to become fuel). Currently part of Bristol’s waste is transported to Holland where they turn this into fuel, however this is something we can eventually tackle here and reduce the carbon footprint even more. Closed-loop recycling is something that we are going to be investigating more around Bristol to find out exactly how these targets are going to be achieved and we will keep you all updated on our progress. The hands of Bristol are Craig White (White design) who tells us about the importance of building things that are healthy for our environment and how fun this can be! The legs follow shortly in the form of Dr Suzanne Audrey (University of Bristol) who encourages us all to get our kids to walk to school and for us to walk to work in order to live healthier lifestyles and cut down our traffic. And finally on the end of the legs are the feet, Andy Gibbins (BCC’s City Design Group.) Andy tells us about the importance of our places- parks, homes and workplaces- and how we are going to take care of these and ensure they all stay healthy. One thing seemed to be agreed by many in the audience at the end, and this was that the focus in planning our Green City needs to start from grassroots in order to effect real change. Something which we agree on here at Down and Out Bristol is that it is important to get your hands dirty and encourage small changes which will hopefully grow. It was great to see all the people involved in making Bristol the Green Capital and to find out how our city is evolving. 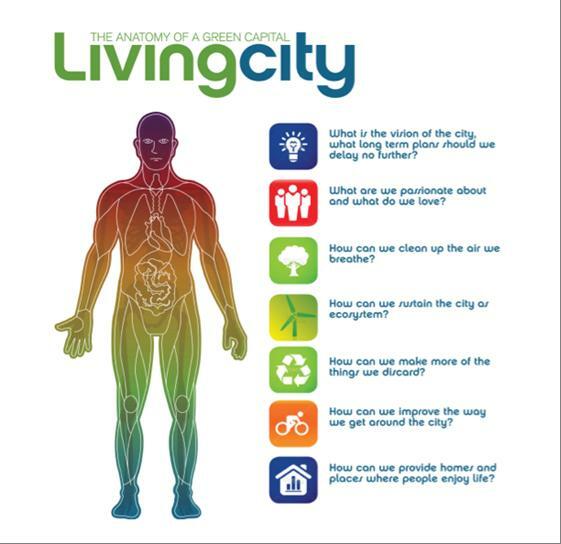 Ljubljana is Green Capital 2016 so we’re planning a road trip to find out how they tackle these issues in their city! ← Tell us your opinions!